So I ended last post with pictures of the wadis in the desert filled with oil. However, the very next day it rained and the whole valley started flooding. This definitely had potential devastating impacts on the oil spill but dams were made to try to contain the oil so it didn’t spill into Jordan. 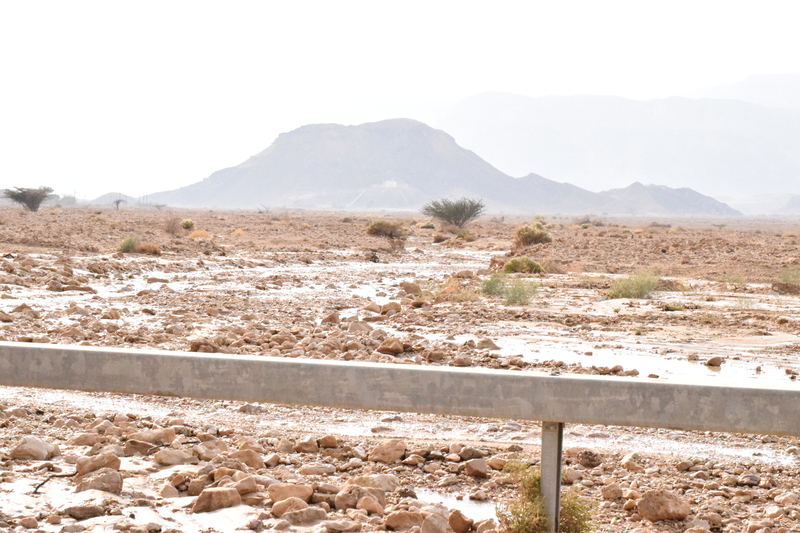 Below you can see a photo of the wadi flowing with water. Ironically, floods hit California the very same day and put these floods to shame as they were gone (or seriously depleted) in about twenty minutes. Still, we saw many members of the kibbutz looking at the floods (the same as us!). The picture below is more of an aftermath picture. 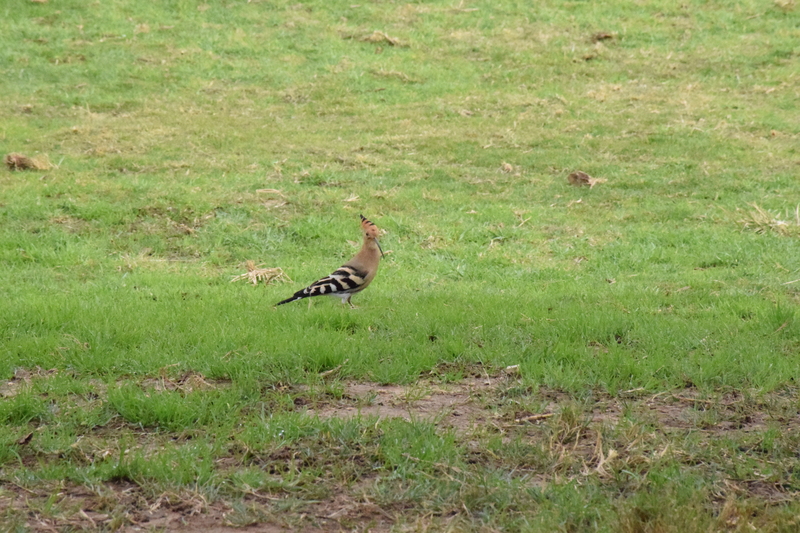 I took it from the car as we were driving back up to the kibbutz. The metal rail in the center of the picture is actually the divider in the center of the road. As you can see, the rocks completely covered the road. This was the largest part of the flood, we were sad we weren’t able to see this flood in action. By the time we got there it was barely flowing. 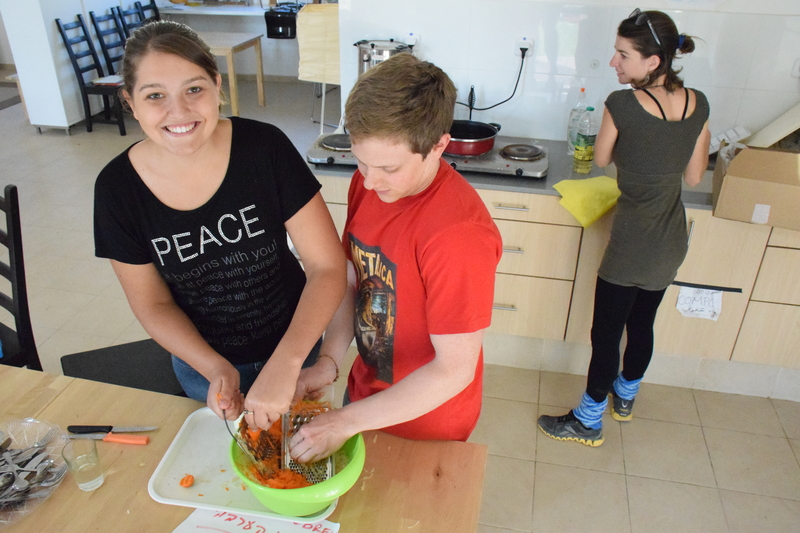 For about two weeks the Arava Institute hosted a Mashav course focused on Water Management in arid environments. Essentially, water professionals from around the world came together for two weeks to learn techniques from the institute. A few of the interns were assigned to introduce them to kibbutz life (hence the hikes in the other blog post) and set up a culture night. 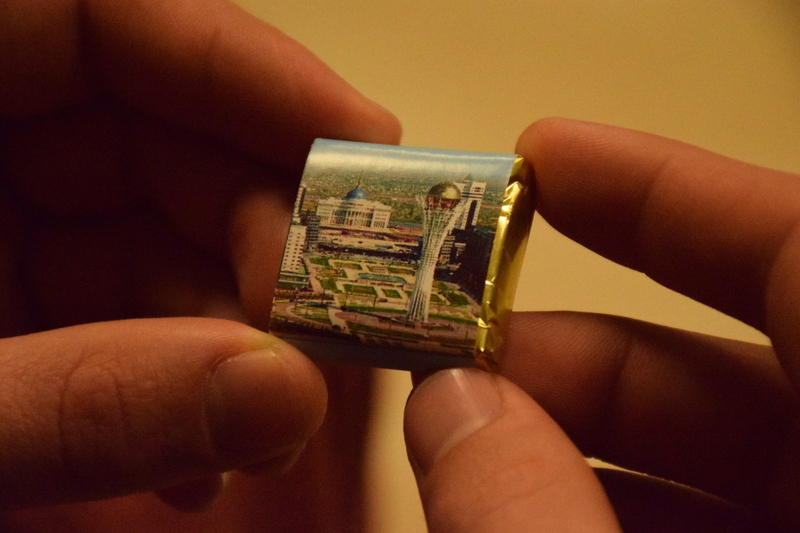 This chocolate was given to us from a woman from Kyrgistan. Her photos of the country were gorgeous and my friend and I have decided to take our private jet and fly there on vacation (jk..jk..). Here’s a lovely group photo of all of us. There were about 15 Mashav people in total. The largest group was from Kenya. 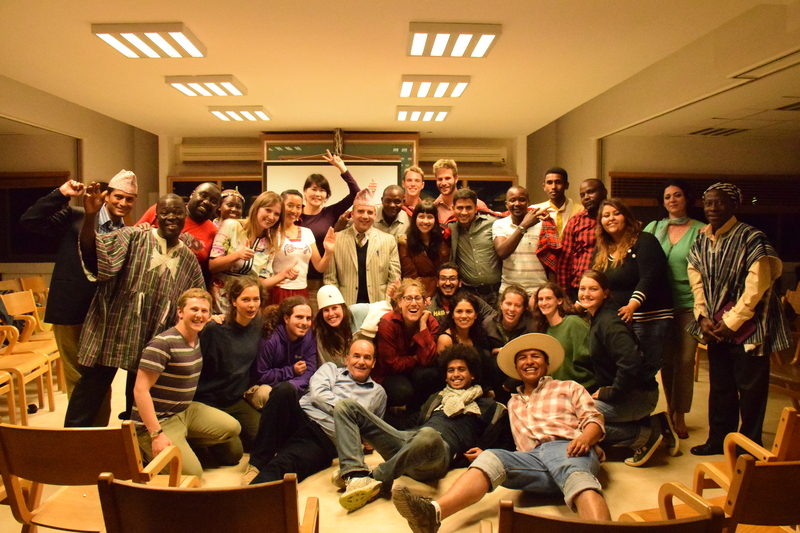 Speaking of our friends from the Mashav course…LOOK! Soccer! 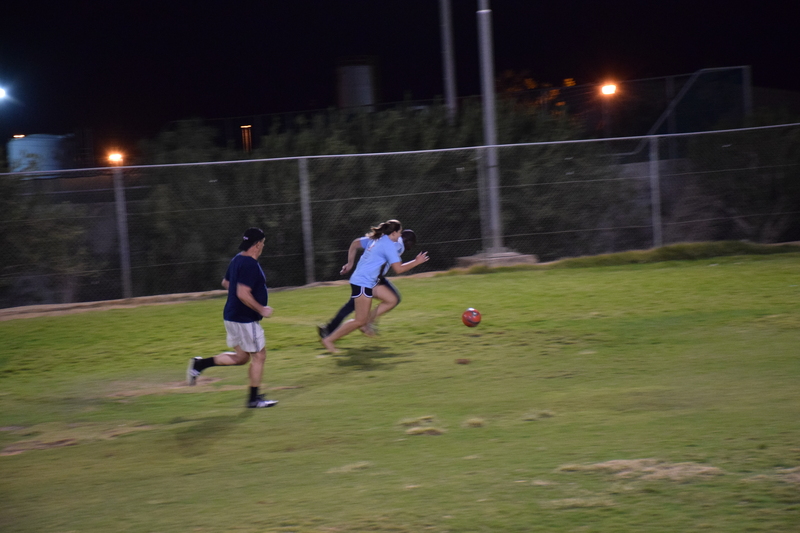 We challenged them to a soccer game one evening and had a total blast. We were very evenly matched and it was so nice to play again. I was one of two girls on the field and abandoned my shoes so that I wouldn’t slide everywhere. The soccer field gets watered around sunset which means it’s never dry when we play which makes for a very slippery game without cleats. I have no idea what the score ended up being, and those are really the best games. So the kibbutz has this nice little pub, and if I wasn’t thoroughly exhausted I would go over tonight and dance for a few hours. 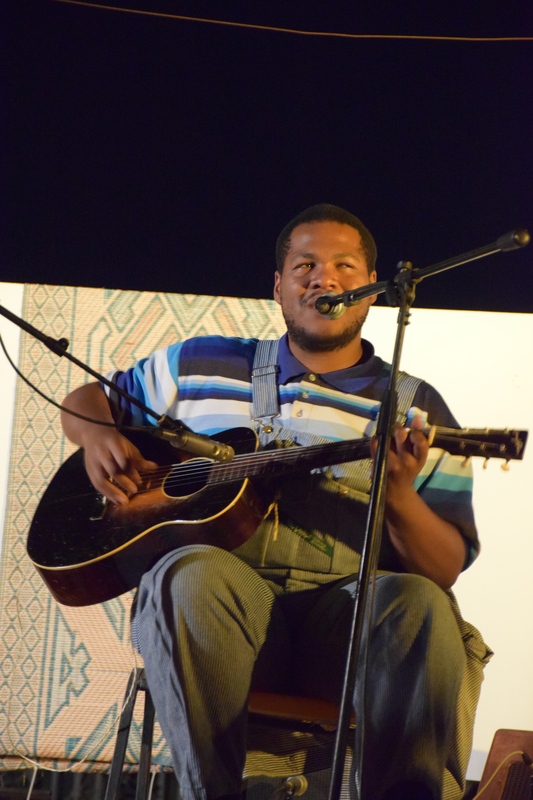 The kibbutz hired this entertainer (awks…I don’t remember his name) to come perform at our little pub and there was free apple cider and warm wine for all. It was an extremely fun event, I believe the performer was from the southern US and he played bluegrass songs on about six different instruments. Our law professor had seen him before and told us that he was blind which makes his performance even more impressive. He’s was a great actor, tossing jokes out between every act and keeping us all very entertained. 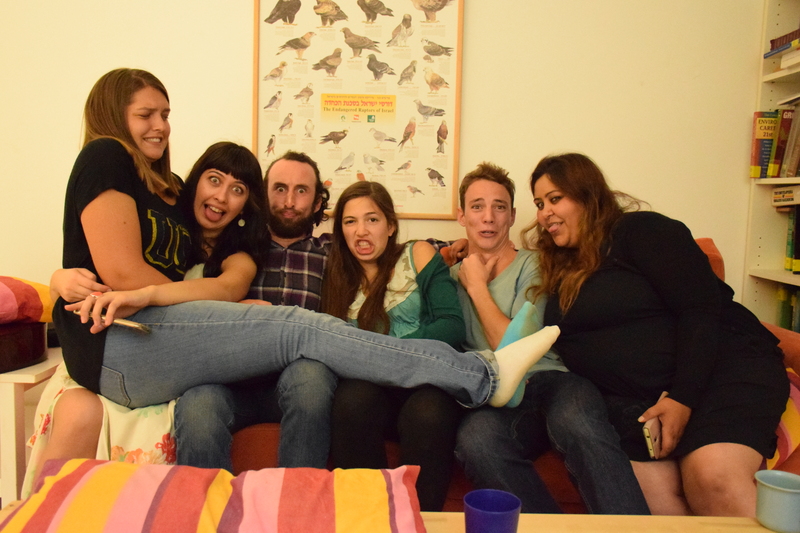 We had another Friday night potluck and this photo was such a gem that I couldn’t resist sharing it. My friend and I made a giant plate of pancakes with nutella (like forty of them) which were very well received as dessert by our friends. One of my classes was an independent research class where I chose a topic, researched it and (eventually) I’ll write a paper about it. Essentially it’s a mini-thesis class which has certainly made me feel better about writing a thesis. 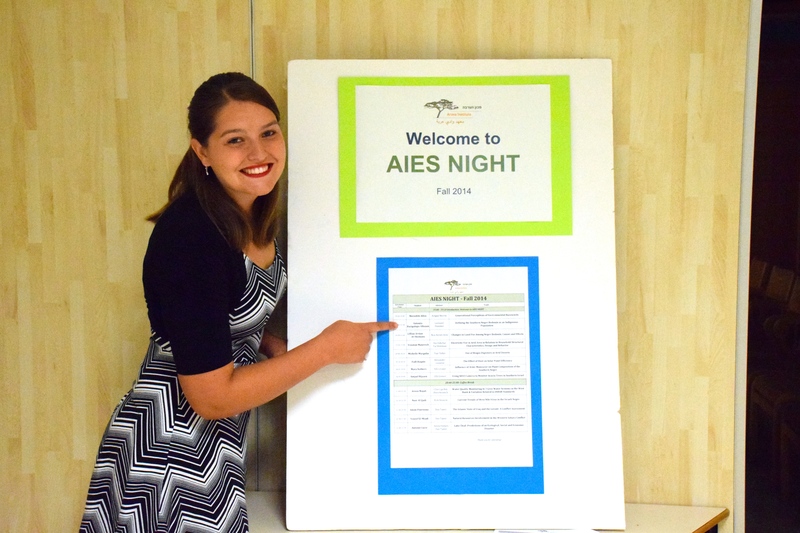 One of the project components was a presentation on AIES Night, an evening where all the students get dressed up present their independent projects. I was the second presenter of the night! Our Hebrew class has a certain amount of cultural education mixed into it, as most languages classes do. As Hanukkah started this week we studied the history behind Hanukkah and then made latkas and our teacher brought sufyiote (doughnuts that pretend to be jelly filled doughnuts but really just aren’t). This is a friend and myself preparing the latkas, a few minutes later I started cutting the onions and a picture was snapped of me crying, this was then showed to others and I told them that my friend had made me cry with a sad story about animals in the snow in the midwest (In my defense he had told me a fictional story about animals being sent out into the snow in the midwest). Yay Hanukkah! Fun story about life on the kibbutz during Hanukkah, but I’m going to save it for the hashtag at the bottom. 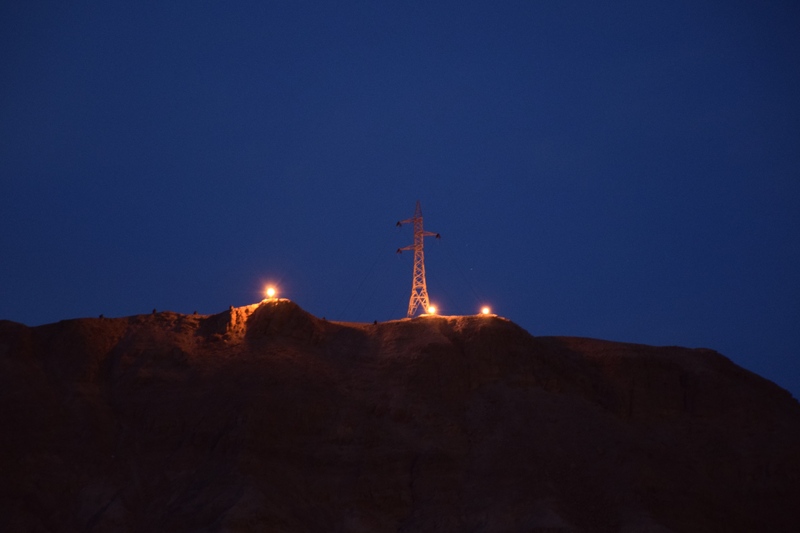 This is just a nice picture of one of the many menorahs on the kibbutz. I really just like this bird. So many awesome colors. Just saying. Okay, so during a fun trip to Eilat where we had lots of extra time – we’d essentially gone just to spend the day, do a couple chores and have fun – we were wandering the mall, halfheartedly looking at clothing (The funny thing about shopping in a place where the dollar is much stronger is that all of the tags give you sticker shock because they say that a nice shirt costs NIS 99 [which is like $30]) when I saw this place as we were heading upstairs. My friend was nice enough to model with the store which made this picture practically perfect. It’s a watch store and I have no idea if that’s what the store says in Hebrew as well but it certainly made me laugh. 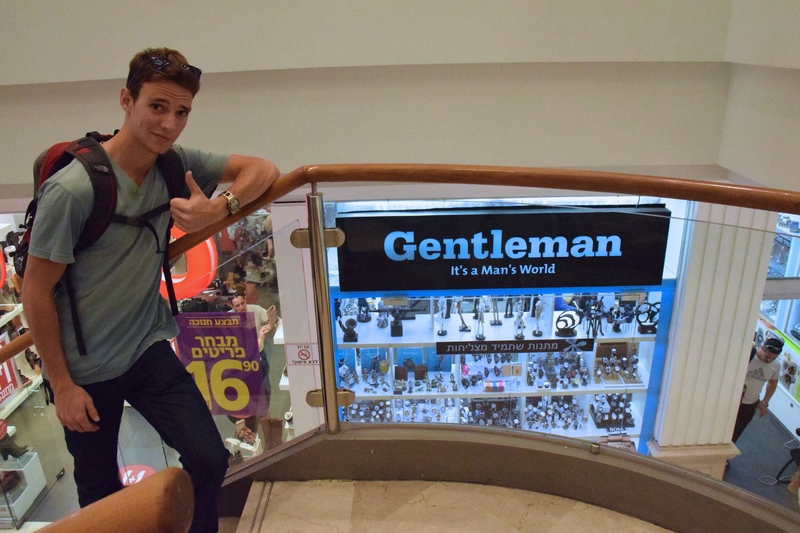 Yes, Eilat Mall, yes it is a man’s world; and a right-handed world as well. The cover photo for this blog is a nice little alleyway that we found in some of the neighborhoods of Eilat while we were on an adventure. #datkibbutzlyfe: Alrighty, so: Hanukkah. Interestingly, Hanukkah isn’t a huge holiday here. We light the candles each evening, there’s a prayer song that goes with each and each candle has a different name, but -and I find this fascinating – the gift giving tradition that exists in the United States exists to a much lesser degree here. I asked my Israeli friends whether their families gave each other gifts on Hanukkah and they told me either “no”, or “maybe one or two but each family does it differently.” I’ve come to the conclusion that the reason for this is probably the lack of competition with Christmas (and the overall commercialism aspect of US culture which isn’t as prevalent here). The fun part of being on the kibbutz this time of year is actually the lighting of the candles. We light our own little “Hanukorah” (no idea how to spell it so I’m going to stick with menorah but I do know the difference between the two), and there’s another menorah in the dining commons but the coolest one is actually up on Electric Mountain. I’m going to try to get more pictures of it from the mountain tomorrow. On the very first hike I went on at the beginning of the semester, my guide told me that the large barrels at the top of Electric Mountain were lit at Hanukkah, one for each night to go with tradition. Ever since, myself and my fellow hikers have been waiting impatiently for Hanukkah so we we could see how awesome it looks. The picture doesn’t actually do it justice, but it’s very, very cool. #datkibbutzlyfe: Fun anecdote of the week! Gradually through the semester I’ve graduated from visiting a corner grocery store, to a real sized grocery store to a supermarket that even had a clothes section and was enough of a department store to make me tear up a little (I’ve really missed department stores, so under-appreciated in the US). But as grocery stores grow larger, they actually have carts that might be worth taking around, especially when you’re shopping for a bunch of vegetables to make a salad. So my friend and I went to the supermarket, and realizing we’d want a cart I headed over to the cart rack, grabbed the first cart and pulled. And I moved all the carts. They were all chained together. Somewhat embarrassed, I retreated a safe distance to where my friend was laughing at me. Unlike me, he knew that to get a cart you needed to sacrifice ten shekels to the cart which could be retrieved when you parked the cart again. I decided that we didn’t actually need a cart and we headed inside.